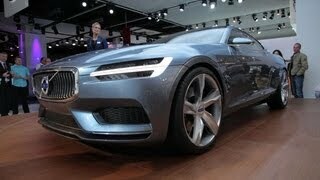 Volvo has unveiled the Volvo Concept Coupe, a car designed to demonstrate the confident stance, the proportions and the most prominent design signatures, ahead of its public debut at the 2013 Frankfurt Motor Show in September. 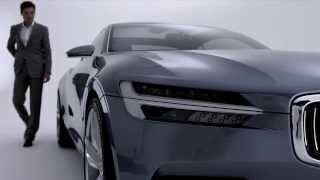 The new Volvo Concept Coupe is the first of a series of three concept cars that reveal the design possibilities created by the company’s new Scalable Product Architecture (SPA). 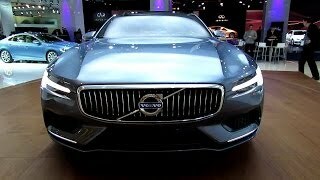 The face of the Volvo Concept Coupe is characterized by a new topography on the bonnet and the ‘floating’ grille, flanked by headlights featuring new T-shaped DRL light guides. The distance between dashboard and the front axle is extended. 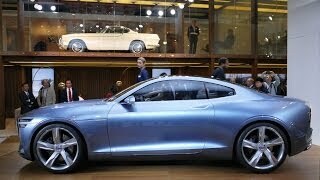 Also seen is a low bonnet, a stylish greenhouse and the rear which recalls the iconic P1800. Other features include the panoramic glass roof and the five-spoke, 21-inch wheels. The blue-grey exterior is echoed on the inside also as the model comes with refined, handcrafted elements such as the leather instrument panel, inlays made of naturally aged wood and the dark blue woven carpets are blended with beautifully machined metal details. A large portrait touch-screen in the centre console interacts with an adaptive digital display and head-up display in front of the driver. The concept car features a plug-in hybrid powertrain that consists of a two-liter high-performance Drive-E petrol engine with a supercharger and turbo. The engine is mated with an electric motor that powers the rear axle. This enables the Concept Coupe to produce a combined maximum output of around 400 bhp (298 kW) and over 600 Nm (442 lb-ft) of torque.